One of the new units for the Dark Elves are the Doomfire Warlocks. I’ve just finished building the first five of them. 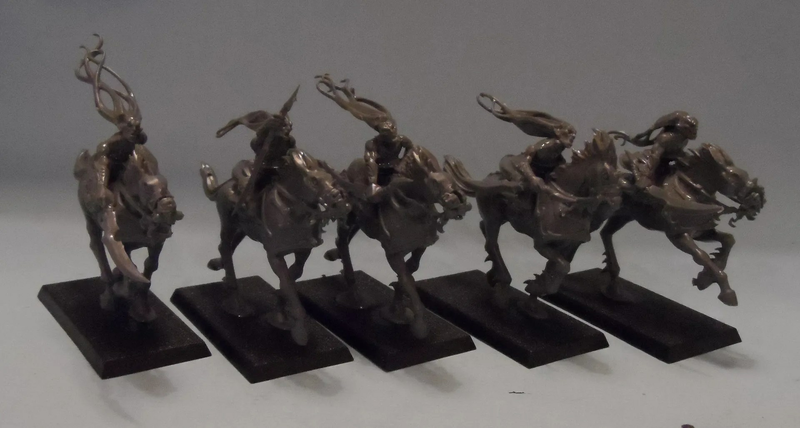 Another unit of Fast Cavalry, and they get to cast spells (yay). I have yet to use them in battle, but that should come w/e after next. The models themselves were quite fiddly as the faces are separate to the flowing hair ! I stuck with it, despite the glue fumes, and the fumes of undefrcoat paint, and gloss paint pervading the kitchen. Good job I was working in a well ventilated place – gloss paint takes ages to dry and as I was doing the back door, I had to prop that open as well. Still stinks though. It didn’t help I was building another 5 Dark Riders, and 5 more Warlocks at the same timne. Key points from the Dark Riders also apply…. Now to prepare for some Laserburn.